Can IKEA pull a rabbit out of its hat in the Indian retail market? Many large business houses who entered the Indian retail space in the last 20 years have been seriously considering whether to continue or to cash out. For most Indians, Swedish furniture retail giant IKEA is known less for its products and more for its founder Ingvar Kamprad, who was among the wealthiest individuals in the world until his death in January earlier this year. Probably, most people are not aware that IKEA has been evaluating its India prospects for over 10 years now and it was only recently (August 09, 2018) that it started operations at its first major India outlet in Hyderabad. However, a question looms on the timing of IKEA’s entry into India: Can it pull a rabbit out of its hat in the Indian retail market? Many large business houses who entered the Indian retail space in the last 20 years have been facing liquidity issues. But today, the bigger threat to them is the onslaught of online retailers (e-tailers) and their discount-based pricing models. Even the original promoters of Indian e-commerce giant Flipkart have sold out to Walmart as they most likely found it increasingly difficult to match the deep pockets of Amazon. On the other hand, Amazon, despite its deep pockets, is clear that it needs to sink another $5bn into India before it can even see the first hints of a bottom-line. It is in this scenario that IKEA has embarked on its India journey, and that too in a big way, by procuring and starting a 400,000 sq ft outlet in Hyderabad. So what changed for IKEA in 10 years? IKEA officials have admitted that when they explored the Indian retail market about a decade ago, they were very skeptical about being able to make profits here. Retail is, by default, a long-gestation business; however, the Indian retail market has promised a lot but not delivered. Most global white goods’ makers learned this lesson the hard way in the mid-1990s. What actually swerved the argument in favor of India was the Centre’s decision to permit 100% FDI in 2018. This was permitted in single-brand retail and this suited IKEA’s strategy perfectly as they were always averse to joint ventures with local partners. Another important change that IKEA has made in India is a modification to the Do-It-Yourself (DIY) model. This model worked well in developed markets where labor is very expensive. So packed flat boxes with instructions were good enough! However, in a cheap labor economy like India, IKEA has adopted a conscious strategy of tying up with local specialists who can also deliver quality installations at a reasonable cost. Remember, IKEA plans 25 stores in India by 2025 and has lined up $1.5bn for investment. Can IKEA really pull a rabbit out of its hat? One of the driving forces of IKEA’s low-cost approach has been its self-assembly approach to furniture. That model has worked in other countries and it may work with the younger Indian crowd. But large parts of India, especially in smaller towns, may find the concept of self-assembly too cumbersome, especially when labor is so cheap here. 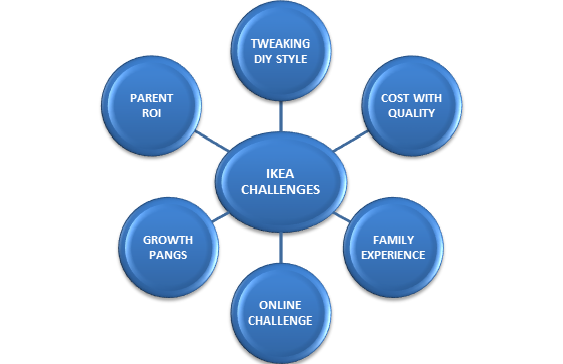 Cost with quality will be the big challenge for IKEA in India. With annual per capita income levels less than $2,000, India is a market that is cost-conscious as well as value-conscious. Online players like Flipkart and Amazon became bit hits in India due to the salivating discounts they offered. However, the levels of brand loyalty can be dangerously low in the Indian market. So, 'low cost + high quality' has to be a perpetual endeavor for IKEA. One of the major highlights of the IKEA experience has been the wholesome family experience. Here again, the IKEA store has already tweaked some of its food offerings. For example, its traditional Swedish meatballs have been dropped and replaced with traditional Indian non-vegetarian favorites. Also, sensitive food items like beef and pork have been dropped from the Indian menus altogether. There is competition and the Indian market is already overcrowded. Most online retailers appear to have access to an unlimited flow of capital. That means the likes of Walmart and Amazon can put up price wars against IKEA for a long time to come. Also, traditional homes are comfortable with the traditional approach. Whether they will shift to assembled furniture in a big way remains to be seen and this will be the litmus test for IKEA’s success in India. Expansion could be the big challenge for the Swedish company. It has just started off with Hyderabad and plans to gradually expand to Mumbai, Pune, Ahmedabad, Chennai, Surat, and Kolkata. However, land acquisition can be quite a tricky proposition in India. There is little title history available and most land areas are subject to dispute. In congested cities like Kolkata, Chennai, and Surat, finding large retail spaces may be a constraint. Finally, there is a very pragmatic challenge that IKEA may face. Keeping prices salivating may appear to be a good strategy in the beginning, but the problems will arise when the Swedish headquarters starts demanding returns on investment (ROI). Competition is high, the market is price-sensitive, and high import duties pose a challenge. All this means that it will take longer to send money back to the parent company. How patient the Swedish parent will be in this game is what will determine whether IKEA can really pull a rabbit out of its hat in the Indian retail space.